Earlier this week, I was interviewed for Episode 38 of “The Podcasters Studio”, a podcast about podcasting technique, technology and philosophy. 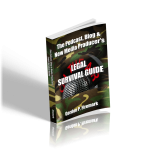 That show's host, Ray, was kind enough to let me plug my podcast, Entertainment Law Update, and my ebook, The Podcast, Blog and New Media Producer’s Legal Survival Guide. Is Ageism in Hollywood getting out of hand? You did what I asked of you… How could you do that to me? Do tiny astronauts have a right of publicity?